DESCRIPTION OF THE BOOK: Meet teenage Wiccan Mila Flores, who truly could not care less what you think about her Doc Martens, her attitude, or her weight because she knows that, no matter what, her BFF Riley is right by her side. So when Riley and Fairmont Academy mean girls June Phelan-Park and Dayton Nesseth die under suspicious circumstances, Mila refuses to believe everyone’s explanation that her BFF was involved in a suicide pact. Instead, armed with a tube of lip gloss and an ancient grimoire, Mila does the unthinkable to uncover the truth: she brings the girls back to life. Unfortunately, Riley, June, and Dayton have no recollection of their murders. But they do have unfinished business to attend to. Now, with only seven days until the spell wears off and the girls return to their graves, Mila must wrangle the distracted group of undead teens and work fast to discover their murderer…before the killer strikes again. MY TWO CENTS: The opening scene of Undead Girl Gang is a funeral—the funeral of teenage bruja Mila Flores’s best and ONLY friend, Riley. It’s a bold start to a story, and Anderson gives Mila a voice that is so funny, so angry, and so captivating that by the end of the first chapter, I was ready to go on any ride as long as Mila was there. And what a ride that was! 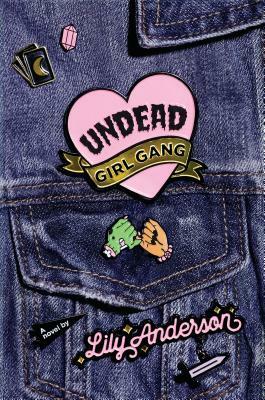 Undead Girl Gang isn’t just about grief and losing your best friend; it’s about justice. Mila refuses to accept the official story, that Riley was the third person at school to kill themselves. Mila is convinced that her BFF was murdered. In a brilliant twist, Mila casts a spell to bring her friend back to life to solve her own murder, but accidentally revives all three girls who died. What transpires after this is shocking, illuminating, and utterly enthralling. Mila must care for the recently revived, all of whom revert to near-zombie-status the further away Mila is from them. But that’s easier said than done when the other two resurrected girls are… well, really, really mean. Anderson does a fantastic job addressing the ramifications of bullying throughout the text, and as otherworldly as this premise may seem, there’s a stark realism to what unfolds. If teenagers were brought back to life, how would they actually behave? How would someone who was bullied react to being revived alongside one of their bullies? How would three teens deal with the restrictions that this situation would require of them? All these issues and so very many more are addressed throughout the novel, and Anderson’s style is a perfect match for such a strange story. Twisty, heartbreaking, and wildly entertaining, this is one of the best YA novels of the year. TEACHING TIPS: Undead Girl Gang is rich with detail and nuance, and there are many moments that can provide teaching opportunities within the book. Note how Mila refers to herself and her body, and how she talks about fatness; this book has absolutely stellar representation for different body types that are not white, and Anderson’s body positivity adds a necessary layer to the story. Since the novel deals with bullying head-on (all the way to the end! ), there are fruitful conversations to be had about difference (and how people are punished for being different) and the power dynamics that are present in character interactions. Additionally, Mila’s brujeria is intricately woven into the story, and you can tell how well-researched it is; conversations about faith and mortality would be apt in dissecting this book. ABOUT THE AUTHOR: Lily Anderson is a school librarian and Melvil Dewey fangirl with an ever-growing collection of musical theater tattoos and Harry Potter ephemera. She lives in Northern California. She is also the author of THE ONLY THING WORSE THAN ME IS YOU and NOT NOW, NOT EVER. She tweets @mslilyanderson. ABOUT THE REVIEWER: Mark Oshiro is the Hugo-nominated writer of the online Mark Does Stuff universe (Mark Reads and Mark Watches), where he analyzes book and TV series. He was the nonfiction editor of Queers Destroy Science Fiction! and the co-editor of Speculative Fiction 2015, and is the President of the Con or Bust Board of Directors. When not writing/recording reviews or editing, Oshiro engages in social activism online and offline. Anger is a Gift is his acclaimed debut YA contemporary fiction novel, and his follow-up, planned for 2019, is a magical realism/fantasy novel about self-discovery.